Interview with Yang Mingming and Li Yuan: For me, it is a very strange concept that one woman gives birth to another woman. Yang Mingming was born in Beijing in 1987, and is a graduate of the National Academy of Chinese Theater Arts. Her debut, a short film “Female Directors,” was deemed one of the most interesting independent Chinese films of 2012 and went to be screened at numerous festivals. She worked with Yang Chao as the editor of his “Crosscurrent.””Girls Always Happy” is her first feature film. On the occasion of the screening of Girls Always Happy at Five Flavours Festival, where the film earned a special mention from the jury, we speak with her and Li Yuan, one of the actresses of the movie, about “Crosscurrent”, mothers and daughters, the shooting of the film, hutong, the situation in Chinese cinema, and other topics. You have worked in Yang Chao’s “Crosscurrent” as an editor. How was the experience of working in the film and what about working with Mark Lee? Yang Mingming: The shooting process of the film was very long, and I was actually the third editor that came, so I did not have any personal contact with Mark Lee. However, the version of the final cut of the film was my version. The movie portrays an extreme but also realistic relationship about mother and daughter. Why did you choose to make a film about this topic? I like to focus on female stories, about women, and I chose to make a film about family because there a lot of things hidden inside this topic and I like the idea of portraying them in a film. The relationship between mothers and daughters always seems to be special. In your film, for example, they always fight but they also love each other. Why do you think that is? (laughs) It is, and for me it is a very strange concept that one woman gives birth to another woman. The mother in the film is a loser and she treats eating as the concept that proves her existence in the world. That is why she uses eating or food in general as a sort of a medicine, as her weapon in essence, against other people, and to establish her authority. During the shooting, I was really tired and it was a very hard process, so eating what I liked during the film helped me work. I did not gain any pounds, but I was a bit swollen. Why was the film split into chapters? Splitting the film into parts, when you are writing a script makes your thinking more structured. I have read that the actual protagonist of the film left before it was completed, and that is why you had to take the part. Can you give us some details about what happened? She was too much involved with another film, and she had to be away from shooting for some time, and when she got back, a lot of things have changed, and we could not continue working with her. How was the experience of directing and acting at the same time? Ahhhh, it was exhausting but I enjoyed it (laughs). Being a director is always very stressful but when you are acting, you can release this stress, so I think I found a good balance and I really enjoyed it. And how was your cooperation with Li Nan? Because the chemistry of the two of you is great. Li Nan is an outstanding individual, both professionally and as a person. Working with her was great because she respected every decision I made as a director, despite the fact that she is a very experienced actress. How was the casting process for the film like? 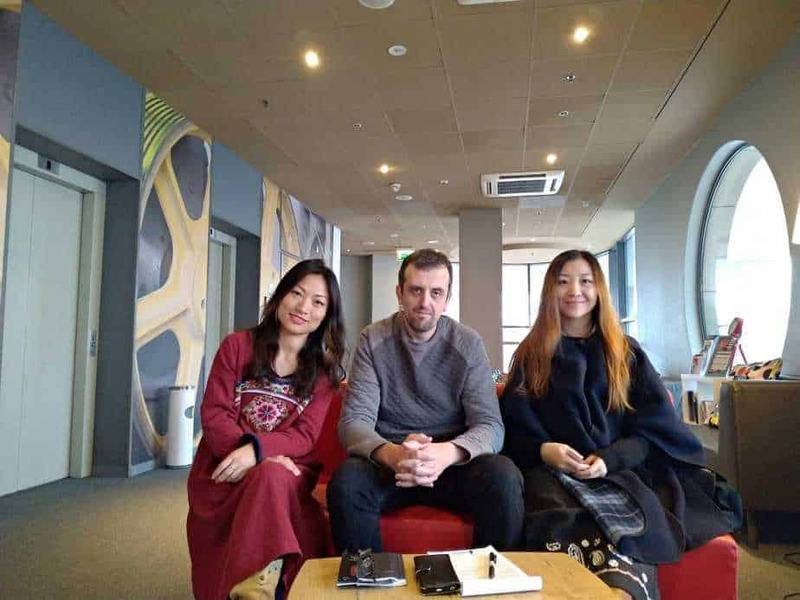 Li Yuan: Yes, because I am living in Berlin, so she sent me 5-6 scenes and I did this e-casting, because I saw her first short film years ago in China (“Female Directors”), and I thought that she was very talented, that she was fantastic. And I thought that I would really like to work with her one day. So, you did not know her personally before the film? Li Yuan: No, I just knew her film. So we talked for a few minutes later on, and that was it. And can you tell us a bit about your experience in the film? Li Yuan: As I told you, we kind of knew each other a little bit before the film, and then we started shooting together and I saw that she worked like she knows everything, and she was in complete control and she was very calm. And she also had to play, but she was still very calm and she had a very strong energy during the shooting and everyone was excited for that, because our team was full of women, just some happy girls (laughter). And I really wanted to help and support her, but since the first day of the shooting, as I stepped on the set, I thought, “this is so nice”, I did not expect a teamwork like that. And it is always good to be around people like that because you feel really professional. The professor in the film has a steady job, income, and the mother considers him an ideal groom, despite the age difference and the fact that he has been divorced. Is that the general opinion in China at the moment? Yang Mingming: Yes, that is how parents see that subject, because they want their daughters to have a stable life and have a partner with steady income, a safe future, and that is the attitude quite often. What is the situation with the hutong in China? Hutong are living buildings and a lot of them are ruined now, but the ones that remained had two options, either to be restored or reconstructed but their rents are really high. The other option is that many families live in one building, and is very crowded and there is very little private space. So most of them have to go to toilet outside, to public ones. So, was it difficult shooting in a place such as this? Haaaa, yes. We searched for the right hutong for half a month and we were going with a scooter around to find the right place and the place we found is just for one family ,so it was basically a door and a small room, but it was not very crowded so it was possible to make a film there. The transportation of the equipment is very hard in the hutong so were transporting them on a scooter and sometimes we had an electric cart (scooter) that could transport equipment. And sometimes the cameraman had to stand on the cart with the camera, and that took a lot of balance. Actually, the cinematographer, Xiaomin Shen is great. And another thing is that in hutongs, is very hard not to have bystanders, so we had to have two people in the entrances just to keep the people passing from coming in the shooting. So the guy that sits in the sofa in the yard is a local? No, he is an actor actually, but in hutong there are many old people who, when they see a chair or a sofa, they will just go and sit there, because they are not comfortable or maybe they just don’t want to watch each other in the house anymore. And so, is there much gossip there, because in the film the mother, at one point, asks her daughter to speak in lower voice, because the neighbors will hear. I think yes, probably, because Chinese people always tend to gossip. In the movie, you are frequently riding this cart-like vehicle. Do you also do that in real life? No, I had some training actually. When I was writing this story, I wanted to include this element and I knew the actress had to be taught to ride it and be familiar with the location and the routes in order for this thing to work. So maybe that is why I chose myself as the leading actress (laughs). What is your opinion about Chinese cinema and the industry at the moment? Independent films do not get much distribution and that is something I think should improve, along with the censorship. I did not have any issues with my film, but I had to cut some sensitive scenes out. But in terms of opportunities, are there enough roles for women? Li Yuan: There are not so many roles, at least not many in different “colors”. The demand is mostly for young women or maybe on a contract or something. Are there any future projects you are working on? My name is Panos Kotzathanasis and I am Greek. Being a fan of Asian cinema and especially of Chinese kung fu and Japanese samurai movies since I was a little kid, I cultivated that love during my adolescence, to extend to the whole of SE Asia. Starting from my own blog in Greek, I then moved on to write for some of the major publications in Greece, and in a number of websites dealing with (Asian) cinema, such as Taste of Cinema, Hancinema, EasternKicks, Chinese Policy Institute, and of course, Asian Movie Pulse. in which I still continue to contribute. In the beginning of 2017, I launched my own website, Asian Film Vault, which I merged in 2018 with Asian Movie Pulse, creating the most complete website about the Asian movie industry, as it deals with the almost every country from East and South Asia, and definitely all genres. You can follow me on Facebook and Twitter. Interview with Leon Le: Violence is like a band-aid you put on a wound that will never heal.